This is a companion to the object-level target and designed to allow scanner performance measurements over a larger field of view. In addition to enabling the same ISO metrics as the object-level target, it can provide for measuring illumination uniformity, spatial distortion and resolution variability over the target's areal coverage. This target is best suited for scanner benchmarking or session-to-session quality control and is compatible with GoldenThread software. This target provides a means to measure sampling rate (dpi), resolution, color, tone, noise and color channel misregistration. Compliant with existing ISO standard's protocols when measured using GoldenThread. 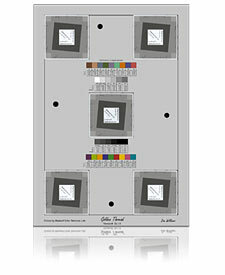 It has the identical 18 color patches of the GretagMacbeth™ ColorChecker®, plus 12 unique spectrally neutral gray patches to better track high dynamic range tones often encountered in many collections. All patches are annotated with their L*a*b* values so, if in the future, doubt arises about the color genealogy of the object, and the target is included in the image, the user has a clear path back to the colors and tones of the original object. One can also quickly check the annotated L*a*b* values of the target against those provided by commercial image editing software. There are also vertical and horizontal slanted edge targets near the center to calculate the spatial frequency response (SFR) along with bar-type wedge features to quickly judge spatial resolution visually (200-850 dpi) or compare against software calculated results. Bidirectional metric- and-English based rulers are provided to confirm sampling rate.